Red dust rising from the scorched land, the vast nothingness, home to the world’s largest monolith, unique flora and fauna – the Australian Outback is one of the last remaining natural landscapes undisturbed by growing human habitat. It is also, quite literally, the heart of the continent covering 73 per cent of its land mass and comprising 5.6 million square kilometres. Given its rich cultural and historical significance – it has been home to Indigenous Australians for more than 50,000 years – and its stark natural beauty, the Australian outback has played muse for many inspired pieces of literature and stoked the fantasy of travellers worldwide. Thus, when Robyn Davidson traversed 2,700 km from Alice Springs to the Indian Ocean accompanied only by her dog and four camels in 1977, she made the Outback accessible - both emotionally and physically - to enthusiastic and adventurous travellers everywhere. Today, the Outback despite its remoteness has become one the more popular tourist destinations; imagine attending the Birdsville Big Red Bash, the most remote music festival in the world, or witnessing ancient sacred Aboriginal ceremonies! It is also a tourist destination that cannot be covered in a hurry or without proper research. And, one Australian couple, through their massively popular website Travel Outback Australia, is ensuring that travellers are well-equipped with adequate knowhow before venturing into the Outback. Amanda Markham, anthropologist and writer, and Gary Weir, a retired park ranger, have lived in and travelled the Outback extensively for 20 years. From climbing the highest mountains of Northern Territory to camping in the remotest part of the continent the adventurous duo has done it all, documenting their experiences on the website to guide other travellers. In conversation with TAL, Gary speaks about the couple’s enduring love for the Outback, the challenges they faced initially after moving to Alice Springs, and the importance of being well-prepared before embarking on a tour of the region. What prompted the move to the Australian Outback? Was the transition from residing in the cities to living in the stark wilderness an easy one? Before moving to the Outback I used to live in Adelaide where, after being retrenched, I enrolled at the university for higher studies. During this period, I had the opportunity to participate in a couple of volunteer programmes in Central Australia and fell in love with the place! I became quite interested in the idea of living there. On completion of my course at the university, I found a job as a park ranger in Alice Springs, so I packed my bags and moved there. Amanda, on the other hand, was studying Anthropology at the university and was deeply drawn to the rich cultural and historical significance of central Australia. Initially, we lived in Kings Canyon, about 300 kilometres away from Alice Springs. I worked a ten-day roster, and on my days off, we drove to Alice Springs to do our shopping and have a bit of town time. It wasn’t easy, but with a bit of planning, you can surmount most obstacles. Also, our professions – forest rangers and anthropologist – have given us much confidence to live and enjoy the Outback and to understand it in more depth than others. We feel a bit uncomfortable when we visit big cities now! Why did you feel the need to document your experiences in the Outback, and what prompted you to create the popular destination guides? Did you think there was a lack of informative literature on the Outback for those who wanted to explore it? Both Amanda and I have lived and travelled central Australia extensively, and feel we have the knowledge and experience that can benefit fellow travellers. We don’t think there is a lack of literature on the Outback, but most of it is from a third person perspective. We wanted to provide tourists with information gleaned from our experiences of living in the region, which we felt would be more appropriate and coherent. 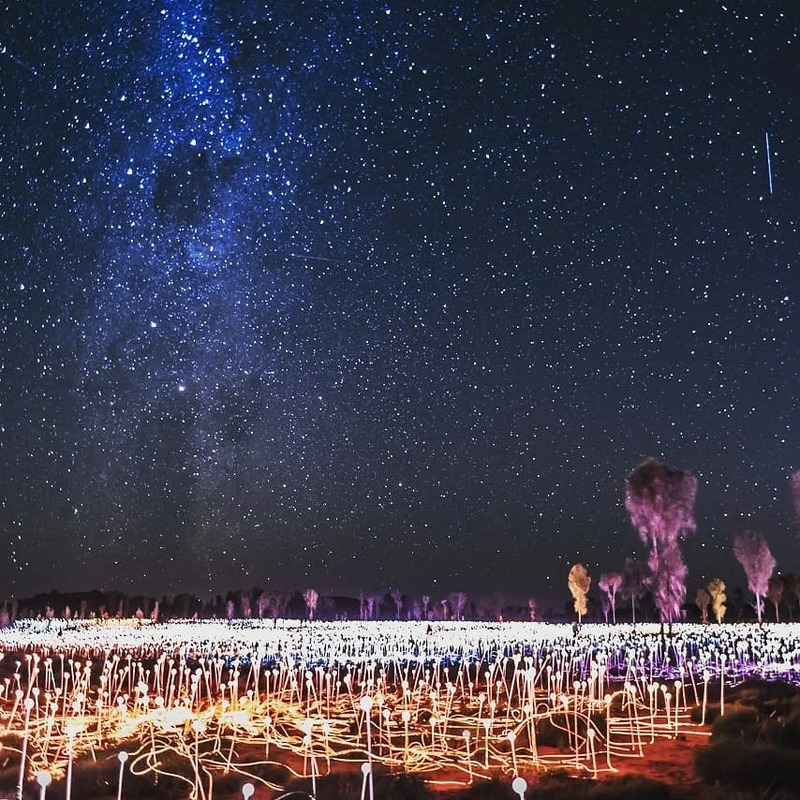 The Field of Light display at Uluru. Many travellers had requested us for downloadable versions of the information shared on our website, so we came up with the idea of making destination guides. These guides can be downloaded on users’ mobiles and be used whenever needed without relying on finicky net connection while travelling. In the last 20 years, what kind of changes have you seen in the Outback - in terms of development? The outback is getting smaller, and by this I mean more travellers are coming here, and they all have different expectations from their travels. With an increase in the number of tourists, there’s a higher demand for improved facilities- better roads and stronger infrastructure. Though it is nice to see more tourists venturing into the region, we have to be careful of the demands we make; for those can massively alter the very nature of the land that attracted us to it in the first place. Its vast and sparsely populated terrain - the reason for its popularity - can be eroded by too much ‘development’, reducing its uniqueness. How many places in the Outback have you visited and chronicled on your blog? Is there a favourite spot that you keep returning to and would recommend to fellow travellers? We have touched upon almost every place in the Outback from the Kimberley to the Simpson Desert. Even now after opting for an early retirement we travel for a month into different areas of the outback. We recommend spending a bit of time exploring the Red Centre. It has a lot of charm and caters to everyone – single travellers, those travelling with families, or couples. The destination guides available on our website will help you manoeuvre your way through the area and also inform you about the attractions to see in the region. Has there been a travelling experience that has touched you and left an indelible mark on your hearts? Living and travelling the great Outback has, in itself, been a touching experience. The magic of the outback seeps into your soul, and you become one with the red earth! We have had so many marvellous experiences that it is difficult to choose a favourite. We have sat around a campfire in the middle of Australia with not a person in sight for several kilometres, and have ventured into what could probably be the remotest part of the country. Our encounter with the Outback has been nothing but blissful. As localities, and avid Outback travellers what factors, do you think, add to the allure and romance of the region? The Outback is not only home to some spectacular national parks, but also contains a sense of remoteness, solitude and a feeling that is foreign to those living on the coastal fringes. The region provides an opportunity for travellers to get out of their comfort zones and see the places that make many an adventurer traveller’s bucket list. Also, there is the Outback night sky…do I need to say more? According to you, what are the most common myths and mistakes people make while travelling to the Outback? There are so many! One of the biggest mistakes is assuming that Uluru, the massive sandstone monolith that is sacred to Aboriginals and is thought to have started forming around 550 million years ago, is just down the road from Alice Springs. It is 450km away! Sunset over Mt Gillen from Anzac Hill, Alice Springs. Tourists often don’t realise that mobiles don’t work in most areas outside of towns or communities and that a satellite phone is a more reliable bet. Also, don’t blindly follow your GPS, and always be ready with other forms of maps. Your blog also speaks about various tech gadgets one should carry when venturing into the Outback. What three essential tools would you recommend to those travelling there? I am a gadget fan, so I take many items, but in my defence, they should be functionally appropriate to the sort of travel I’m doing. Otherwise, they all contribute to the extra weight I’m lugging around. I’d recommend that people carry some means of communications devices - a satellite phone or a personal locator beacon - other than mobiles to help them contact the outside world in case of an emergency. While we recommend taking paper maps on your travels, there is nothing quite like knowing exactly where you are, so having a tablet with a mapping app on it is worthwhile. Thirdly, invest in a good quality small mobile fridge that will keep your drinks and food fresh and cold. Mungo National Park in outback NSW. After travelling and living in the region for more than 20 years, what are your future plans? We have finally moved away from central Australia and are now living right at the southern extent of the outback where we have a small property. We have started working on living off-the-grid, and generate electricity for our consumption using solar panels. We also grow our own food. We will continue to grow our website and social media presence and are still keen to share our experience with other travellers. Learn more about on the Outback on Amanda and Gary’s website. Read more: Stories from the Outback.